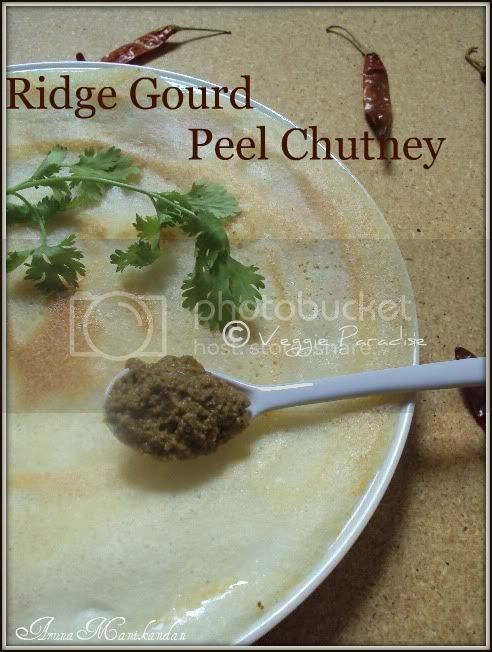 This is a delicious and tangy chutney prepared with Ridge Gourd peels. Very less ingredients is used and it takes less time to prepare too. 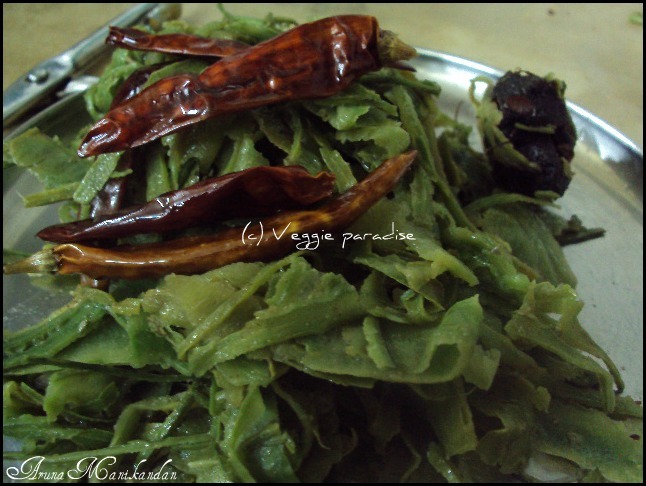 This goes very well with Idli's / Dosa's/ Roti's or simple have it with curd rice. 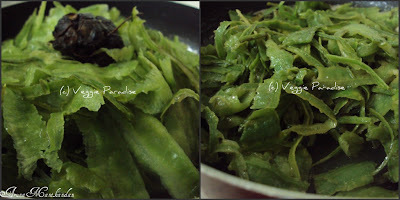 Heat oil in a pan, add the skin, along with tamarind and saute it until the skin turns slight brown, remove from heat. Now add red chillies and saute it. Grind all the ingredients with salt and sufficient water. 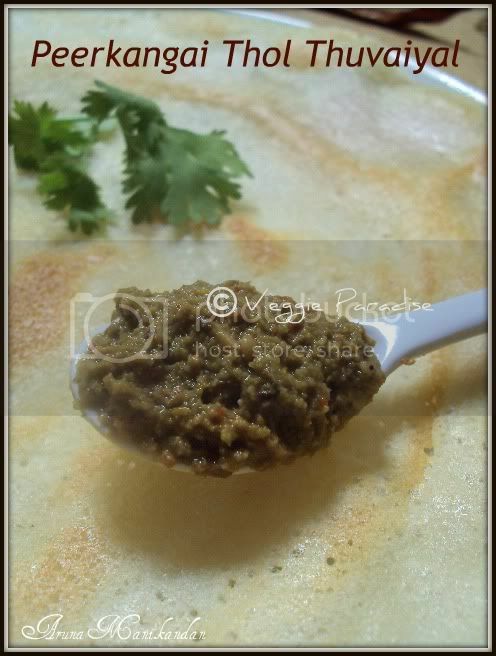 In a seperate pan, heat oil and add mustard seed when it stops spluttering, add urad dal. saute for a min. and Add it to the thuvaiyal. Tamarind is fried along with the ridge gourd peels, so that it becomes soft and while grinding they blend well. You can also use the seasoning ingredients at the final stage of grinding. I love this chutney,urs looks very delicious.I usually end up making chutney with the entire ridgegourd which is also tasty. This chutney is new for me. 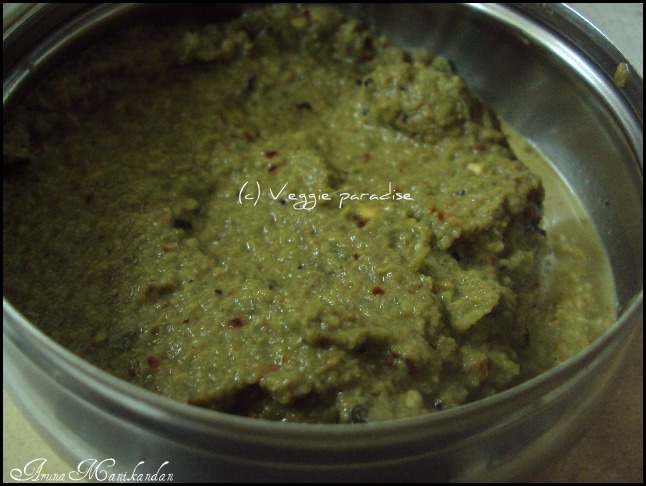 Simple and easy yummy chutney..
My most favourite chutney,can have two more idlis with it. 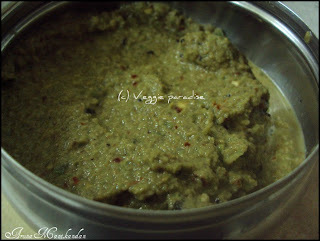 love this chutney, easy to make...perfect with idlis. your recipe is toooo good aruna...will surely try this.. Seeing this for the first time ever....lovely n healthy! 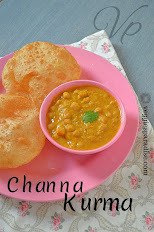 Flavorful chutney, new to me..
Its new to me but very interesting I will definitely try this! Yummy chutney,love to mix it with rice. A yummy chutney..I love this one!! 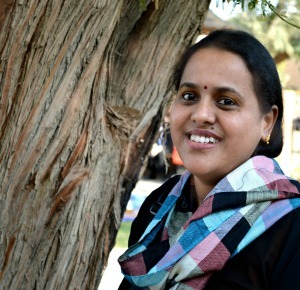 Hi dear, you have an award waiting at my place. Do collect it. we make this often at home. Awww... with your crisp dosa, I am drooling here. superb! Wonderful chutney..love this idea of no wastage..even the skin can be used to make this delicious chutney. Nice and delicious chutney..looks so tasty.. I prepared this chutney in a different way..will try your version next time.